How Long Have You Been In Operation And Can I Trust That You'll Be Around To Service My After-Sales Needs? Why Should I Buy From United Business? If I'm unsure about whether a product is right for me or unsure what my requirements are can you help me? Can I purchase goods from United Business from countries outside of South Africa? Can I Come Into Your Physical Outlet To Collect And Pay? Can You Send Me The Prices For...? Is The Price On The Site Correct? Do You Keep Records Of Credit Card Details If I Process My Card Telephonically With You? Will Payment Method Affect Delivery Times? I Bought A Product From Another Store In South Africa And It Doesn't Work. They Seem Unwilling To Help, Can You Help? I Bought A Product From You And It Doesn't Work/Is Defective, What Do I Do? While Mantino Trading Pty Ltd the holding company of United business has been registered since 2001. The non-online sales division of United Business has been in operation for over 30 years within the office automation industry. We have a comprehensive service base throughout South Africa. References are available upon request. United Business is the online trading arm of Mantino Trading's office automation interests. As an online business United Business's main selling point are its highly discounted prices. UBS can do this due to the fact that quotes are sent directly to the enquirer with no need for a large sales force. This however does not imply a reduction in service, United Business Solutions runs on exactly the same service infrastructure as our existing brick and mortar operation. This means United Busines Customers get the benefit of online pricing without compromising on service. Of course, assisting clients in choosing the correct solution for their office needs is our specialty. Contact us and we will arrange for one of our specialist client liaison to come around and complete a full needs analysis, assisting you in choosing the correct product at the correct cost. African clients based outside of South Africa can purchase products from United Business including Photocopiers, Printers, PABX Systems, and more. Once payment has been made and is reflecting in the accounts of United Business solutions the products will be available to be collected for dispatch to their final location. Please note United Business will only supply the desired products to locations in South Africa, transport to countries outside of South Africa is the responsibility of the end user. Contact our sales consultants via email at info@unitedbusiness.co.za or 086 001 8101 (Intl Number) - (27) 011 239 8720. For the larger more complex products which require individual solutions such as Photocopiers, Risographs UPS systems and PBX Systems. UBS client liaisons send personalized quotations to you using the "Quick Quote" Method. These quotations can be requested via our website or by contacting us at 086 001 8101. For the remaining products UBS allows for simple, safe and convenient online purchasing. Simply place your required goods in the basket and when you're ready checkout, an account will be immediately generated for you. Pay using Credit Card, EFT Transfer or Open an Account with UBS. Once you accept the quotation, fax or email a signed copy of the quote back to UBS to activate the Job. You place your desired products in the online shopping cart. Once you are satisfied you have the products you require select the "checkout" option. Simply fill in your details and process the order. Cash transactions are facilitated by EFT transfers into UBS's bank account or via our online payments system. All major cards are accepted. Once funds clear the goods will be delivered and installed (if necessary) by our team. Yes all of our branches are collection points for COD purchases. However please check that we have stock before coming in. We will inform you if there is stock at the specified branch. United Business already sells it products at highly discounted prices. However for large orders, discounts can be negotiated at our sole discretion. United Business has a large supplier network encompassing a broad spectrum of the office automation and office equipment markets. If you cant find it on the website, that does not mean it is not available. Simply click on the "Quick Quote" button at the top of the page and ask us, you should receive a response within the hour. United Business is the perfect vehicle for company or insurance quotes. Our pricing is such that we are a regular supplier to Insurance industry and can supply professional quotes to your company in minutes. Orders may only be cancelled up to the point where they are shipped. Once orders are in transit we cannot cancel the order. This applies to cash sales only. We do all we can to ensure that our prices are correct and take great pride in the fact that in nearly all cases they are. However glitches can enter the system, so if you are not 100% sure please contact us for confirmation on the pricing. All effort is made to ensure stock availability. United Business has warehouse facilities' in Durban, Johannesburg and Cape Town ensuring the whole country can be comprehensively serviced. However due to our wide range and the often specialized nature of a portion of our products stock is often ordered on an individual request. For peace of mind please enquire using the quick quote system as to stock availability on your desired product. All credit card records are removed from our system as soon as the manual transaction has been concluded. Yes. 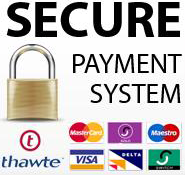 We process credit card payments using VCS (Ply) Ltd secure software. VCS's system is approved by all the major banks and credit card companies. Our UBS online shopping system forces the customer's browser into a secure mode, encrypting all information entered into the forms on its website while interacting directly with the banks through VCS's systems. United Business provides four main payment methods. Credit card refunds - we are able to reverse transactions on our payment gateway system. The refund will only reflect on the credit card used and no other method is allowed. Bank Transfer (EFT) refunds - once an email with the order number, full banking details and request for refund is received, it may take up to 3 working days for the refund to be processed by our accounts department. Please send request for refund emails to info@unitedbusiness.co.za. If a refund forms part of a return, then the terms applicable to returns apply as well. All Orders over R300 are shipped free. Orders under R300 incur a flat R50 delivery cost. United Business however retains the right to alter these charges on exceptional items such as industrial shedders and UPS installations. Yes all of our branches are collection points for COD purchases. However please check that we have stock before coming in. We will inform you if it is in stock at the specified branch before hand to save wasted trips. Credit card transactions are captured immediately and processed as confirmed orders.. For bank transfers, we require the transaction to clear into our account before the order is processed as confirmed. From Nedbank this takes less than 1 working day. Transfers from other local banks take 2 to 3 working days to clear. Transfers from foreign banks may take longer. The consumables required to run the machine delivered to the customer as and when needed. Full technical support, designed to keep you printing. We have a full technical team set up to help and assist our existing customer base. We are always willing to assist where we can. Should you require work to be done we will happily quote you on a pro rate basis for work done by our technicians. If the product still lies within the warranty period United Business will contact the relevant supplier and arrange an assessment. One of two things will then occur. The supplier will determine that the claim is valid and fulfil the warranty by either repairing the defect or replacing the product. United Business will return the product to you at no cost to yourself. The supplier will determine that the claim is invalid. The customer will then be liable to pay for transport back to themselves or collect from our offices. United Business offers repairs on a pro rata hourly basis. Contact one of our client liaisons and they will arrange an assessment and quotation for a repair to your equipment by one of our professionally certified technicians.